While everyone enjoys answering questions on the forum and wants to help out, many Cub questions have been asked quite frequently and the answer is always the same. To help speed up the time it may take waiting for an answer on the forum, this FAQ page should provide you with the answer you need to some of the frequently asked questions. What oil should I use in my Cub? How do you prime an oil pump? What are the two holes for in my hood? I was working on my Cub and now it won't start. What could be wrong? Does my magneto have the original coil or an external coil? What type spark plug should I use? My Cub will not move as if the rear wheels are locked up. What's up with that? My Cub suddenly stopped and my engine is locked up. What now? Should my Cub be positive ground? My Cub quit running and has to set for 15-20 minutes before starting again. What could be wrong? I hear a clunking or crunching sound in the rear of my Cub? Is it time for a tear down? Why does my Cub run for a few seconds and then stop? Why is oil leaking from my steering housing? I have oil running out my axle housings. Are my seals bad? Where can I find more information to make repairs to my Cub? 1. What oil should I use in my Cub? Stick with the recommendations in the most recent Owner's Manual, which lists specific viscosities (including multis) for given temperature ranges. Today's oils are much improved over what was available when the original manual was printed. Keep an eye on the condition of the oil and if it darkens prematurely you may need to change more frequently. 2. How do you prime an oil pump? There are two places where you can easily prime the oil pump. On the left rear side of the block above the touch control oil lines (if you have touch control) you will see an allen head set screw. If you remove this set screw you can pump oil directly to the oil pump with an oiler. The other place to do this is to remove the cover from the oil filter and look down into the housing for the filter. You will see a small hole towards the front where you can prime. If the set screw is difficult to remove you can just use the filter housing access. Pump some oil into either location crank the engine over by hand or by starter. If you use the oil filter housing you can tell you have prime when the oil starts coming out of the hole. 3. What are the two holes for in my hood? The two holes in the hood were for oiling the generator. On the original generators there were oil caps at each end of the generator. The holes were for inserting an oil can tube through to oil the front bearing and rear bushing. The front bearing may have been replaced by a sealed bearing, while the rear bushing could be replaced by an oilite bushing. Check your generator to see if you have the oil caps. If yours does, you may want to shoot a little oil in them. This question pops up more than many think. The answer usually is another question. "What's the last thing you fooled with while working on it?" Many times the owner inadvertently makes a change. In this case you need to retrace your steps. 5. Does my magneto have the original coil or an external coil? The Cub magneto and coil were built as one unit. The coil is under the black cap mounted on top of the magneto with the wire going to the center of the distributor cap. Many times an owner will use a standard coil when the original goes bad. In this instance you would find a coil mounted close to the magneto with the coil wire going into the magneto cap. This would be an external coil. An external coil requires power from the battery. The switch on a magneto with the original coil will have a single wire to the magneto and no connection to the electrical system. 6. What type spark plug should I use? Everybody has their favorite brand. Many lean towards Champions but that is up to your preference. For show, or light use you should go for a something in the heat range of a Champion D21. If you plan to really put your Cub to work then a Champion D15 or D16 would be better. 7. My Cub will not move as if the rear wheels are locked up. What's up with that? 8. My Cub suddenly stopped and my engine is locked up. What now? Before you hit the panic button there are a few simple things to check. 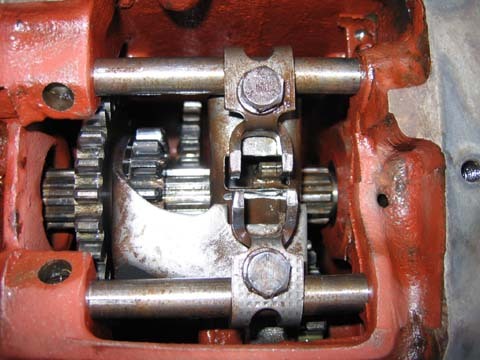 First, ensure that your transmission is not stuck in two gears. Next, loosen your fan and generator belts and determine if the fan and the generator turn freely. If either fan or the generator seize it would give the impression your engine has locked. After you are certain none of these are the problem, take a hand crank and try to turn the engine by hand. If the engine does not turn then, you will need to look for more serious problems. 9. Should my Cub be positive ground? All Cubs prior to serial number 224401 and Lo-Boys prior to serial number 18701 were six volt positive ground with the wire coming from the side of the distributor connected to the + side of the coil when they left the factory. This could been changed by a previous owner. It will be okay as negative ground but if so, you need to make sure the wire coming from the distributor is then connected to the - side of the coil. 10. My Cub quit running and has to set for 15-20 minutes before starting again. What could be wrong? It is very possible your coil is overheating and shutting down. Once the coil cools after sitting for a period of time your tractor will run again until it overheats again. A new coil is the cure in this situation. 11. I hear a clunking or crunching sound in the rear of my Cub? Is it time for a tear down? Many times a clunking noise is thought to be a final drive or transmission problem. In reality, one of the biggest causes of a clunking noise from the rear is a loose rim, wheel center or weights. Tighten all the lug and weight bolts before deciding to tear into any major driveline assemblies. You may save yourself a lot of work. 12. Why does my Cub run for a few seconds and then stop? It is likely you have dirt in the main metering jet. If you have an IH 3/4 updraft Carburetor the metering jet is the brass hex headed fitting on the side of the carburetor. Remove and thoroughly clean the small hole inside metering jet using a soft thin wire such as copper. You may also want to give the jet a shot of carb cleaner. This would be a good time to clean your sediment bowl and check your fuel tank for cleanliness. 13. Why is oil leaking from my steering housing? There are two things to take in to consideration when this problem occurs. First, your steering housing needs to breathe. To do this there is a hole in the flat sides of the fill plug. The hole is drilled part way through and connects to another hole that extends up from the underside of the plug. Many times this hole becomes clogged and pressure builds inside the housing, pushing oil out the seals. Running a small wire into the hole and blowing air or a cleaner such as brake clean or the like will normally clear this problem. If you clean this plug and the problem persists, it is time to replace the seals. Second, water will run down the steering shaft and get into the housing past your seal. This will overfill the housing Many times it is this water, mixed with oil, that is expanding and trying to get out. Remove the drain plug and flush with kerosene. Refill with 80-90 gear oil or something similar. 14. I have oil running out my axle housings. Are my seals bad? There is a very good chance they aren't bad. Your fluid leak is probably caused by an overfull transmission. You may be able to solve your problem by draining the transmission, flushing it with kerosene and re-filling with 3 1/2 pints of gear lube. Cub transmissions tend to collect water over time and it is possible that your case is full of water and oil. 15. Where can I find more information to make repairs to my Cub? The "TC-37F Cub Parts" is another great addition to your library. It lists all the parts used on a Cub and has many exploded views to help you understand where a part goes. This manual is also available from the sources listed for the repair manual. We hope the above information helped you in some way. If you need more help feel free to ask your question on the main forum. The guys there are very helpful and will walk you through generally any repair your Cub will need. Prepared by fellow Cub owners.